Anyone who visits or lives in New Bern even for a short time, soon learns there is an active musical and theater community. The city abounds with talent, young and old alike. 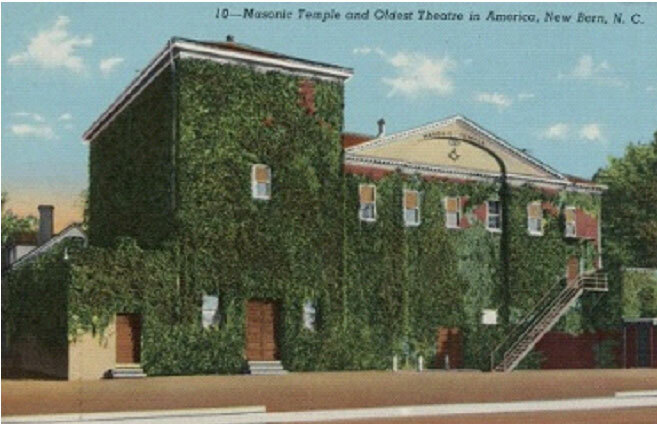 Beginning in the 1800’s, anyone who was anyone in musical theater, opera, and later, film appeared at the Masonic Theater on Hancock Street in New Bern. But in the 1930’s a long running musical tradition began in New Bern at that very stage. On December 19, 1936 at 11 pm the Yuletide Revue, America’s oldest Christmas Charity show began. It became a tradition for years in New Bern and all the proceeds from the Revue were used to provide joy to underprivileged children during the holiday season. The Revue was held on the stage of the Masonic theater, America’s oldest operating theater, and it became the birthplace of what was to become America’s oldest Christmas charity show. The Revue, besides its charitable purpose, became a showcase and springboard for local talent to pursue national recognition and stardom. In a newspaper account published in the New Bern Mirror, December 19, 1958, it was reported that the “Yuletide Revue is a traditional part of New Bern’s Christmas because the citizens here have made it so.” For many years the Revue was held at the Masonic Theater, but in later years it became a tradition to hold it at New Bern High School. Many performers who went on to fame had their start at the Yuletide Revue. Mickey Gunnerson, a Wilmington native raised in New Bern, had her debut as a dancer at the Revue when she was four years old. She later attended the University of North Carolina where she studied dance. In 1952 she moved to New York City, continued to study and was featured in seventeen shows on Broadway, including “How to Succeed in Business without Really Trying”, and “Sweet Charity”. She was also in revivals of the “Pajama Game”, “My Fair Lady” and “Brigadoon”. Mickey was known for her talent, professionalism and reliability. Another featured performer who got her start at the Yuletide Revue was Kathy Young. Kathy, a native of Greenville, first appeared in the Revue as a tap dancer at the age of two, but eventually went to Hollywood and signed with Paramount pictures as a starlet. She appeared in movies with Bing Crosby and Cary Grant, including “Christmas Holiday.” She later became a photographer’s model and appeared on many magazine covers. There were many other people who did not appear on stage, but were important contributors to the Revue. O.A. Kafer was Manager of the Masonic theater and donated its use in the early days. George Fuller provided the use of pianos and organs for free. And who was the originator of the Revue? It turns out it was J. Gasgill McDaniel, Editor of the New Bern Mirror who produced, staged and directed the Revue every year, and even purchased his own ticket. When questioned as to why he did this, McDaniel replied, “The least I can do is remember the unremembered.” McDaniel came from a family of ten, who “Santa never forgot.” Since its inception, the New Bern Yuletide Revue provided gifts for over 5,000 children.